What's the deal with bounces? A bounced email (or simply "bounce") couldn't be delivered and is returned to the sender. In most cases, it contains information from the mail server, saying why the email could not reach its recipient. 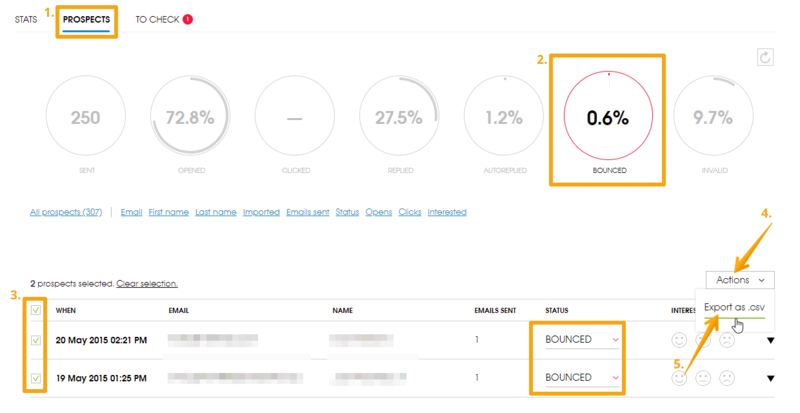 There are two kinds of bounced emails: "hard bounce", and "soft bounce". These are appropriately named; in short: if you soft-bounce off a mattress, you can try it again (how cool is that, after all), but that's not the case with bouncing off hard surfaces. Hard bounce is "permanent", in the sense that the address is found to be invalid, or otherwise unreachable. It is not advisable to resend hard-bounced emails. Soft bounce is temporary, as the recipient's address is recognised to be correct, but the email couldn't be delivered because the recipient's mailbox is full or the mail server is temporarily unavailable (many more reasons possible). Retrying is definitely an option. In either case, Woodpecker will assign the status "BOUNCED" to the related prospect automatically, and will not continue sending emails to that address. You can review the information in the bounced email and decide whether to change the prospect's status back to "ACTIVE" in order to retry. If you do so, Woodpecker will resume sending to that prospect. Bear in mind that they will next get the follow-ups. A solution is to copy your campaign (use the "Copy" button from the drop-down menu on the right), and then add that prospect to this additional campaign, so that the first email can be resent to them. Open the Inbox in Woodpecker, then click "BOUNCED" in the categories on the left. Any bounced emails are recorded by Woodpecker, and you can access them right here. 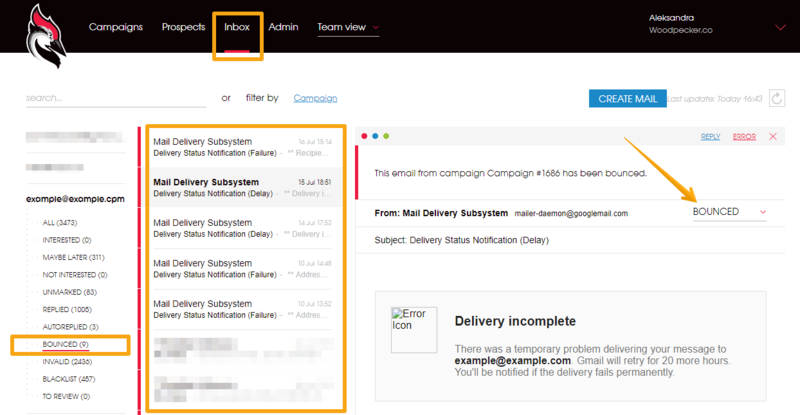 Open the Campaigns menu, then click any campaign that has some bounced emails (take a look at the stats), and open the Prospects tab in that campaign, next click the filter "Status" and select "BOUNCED". Check the related emails in the list by expanding the displayed entries. You can download and export this list of prospects to a CSV file, by selecting any entries and clicking "Actions" (top-right), then selecting "Export as .csv" from the drop-down menu. Open your Prospects base in the App, click the filter "Status", and select "BOUNCED". Next, expand any entry, and click the number in the column "In Campaign" to go directly to the bounced email for that prospect in the specific campaign. You can download this list of prospects to a CSV file here as well: select any entries, then click "Actions" (top-right), and select "Export as .csv". So, what are invalids all about? "Invalid" refers to an email address that has been verified by the system as – you guessed it – invalid, either because there was a typo in it, or because it doesn't exist, has been deactivated, or otherwise cannot be reached at all (e.g. because it's in a closed network). Email addresses are invalidated by the App before your emails are sent – Woodpecker checks if the recipient is there and can get your email. If this is found to be false, this status is assigned automatically, and no emails are sent to that address. Some of these addresses may simply contain a typo, which can be easily corrected by you once spotted. That is why it's a good idea to check prospects with the Invalid status once in a while. Open the Campaigns menu, then click any campaign that has some invalid addresses (take a look at the stats), and open the Prospects tab in that campaign, next click the filter "Status" and select "INVALID". A list of invalid addresses in that campaign will be displayed. You can export this list of prospects to a CSV file, by selecting any entries and clicking "Actions" (top-right), then selecting "Export as .csv" from the drop-down menu. Open your Prospects base in the App, click the filter "Status", and select "INVALID", then check the emails in the list.